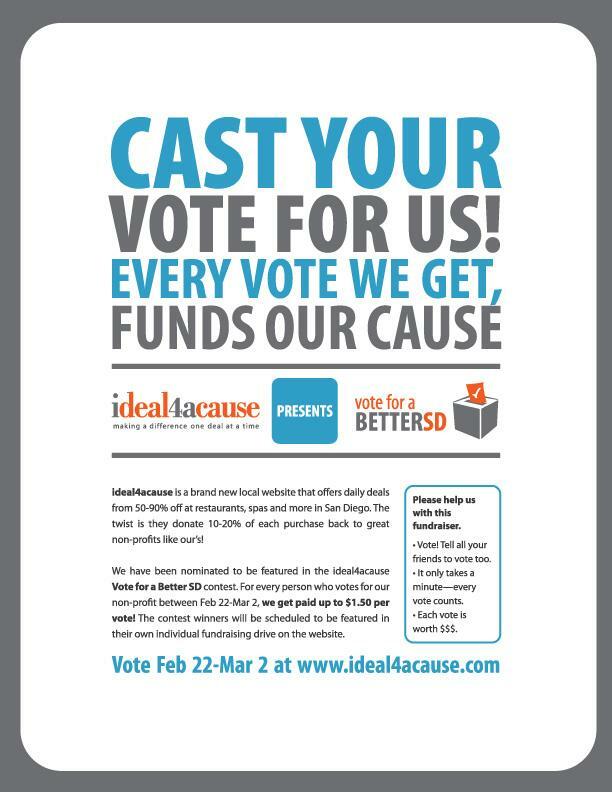 VOTE for us on IDeal4aCause! San Diego! Please VOTE and then spread the word to your colleagues, friends, and supporters in San Diego! TeenNow California is partnering with IDeal4aCause, which is a Groupon-like business that helps local non-profits earn money. We earn money for every VOTE we get from San Diego from now until March 2nd. After the vote we will get to be a featured charity for a deal on the website and earn even more money! This money goes towards our scholarship program for pregnant and parenting teens and teen leaders. VOTE HERE!!! ← TeenNow California Poster Contest!